Our fully-catered expedition (with mule-train – all you’ll have to carry is a day pack!) will guide you through landscapes dominated by deep valleys and high plateaus, cliffs, caves and pristine crystal clear mountain rivers, all set against the white peaks of the Himalaya. We will be visiting ancient Bon Monasteries that sit in the hidden valley in Dolpa, once we reach here after 6 days walk you will have the chance to sit in at the prayer ceremonies and even talk to the locals. The monasteries date back thousands of years and there are traditions practiced there today as they were thousands of years ago. On certain days we’ll walk with a gap between each of us to give the chance to be alone with the spectacular scenery. On certain evenings after the days walk we’ll be happy to sit and practice some gentle yoga and pranayamas. Every night you’ll go back to the same tent and be asleep under the stars. Every morning you’ll be woken up with bed-tea. Once back in Kathmandu you’ll be staying in a luxury hotel with the option of a Nepali Massage. Days 6-11: Now you will be getting used to walking 4/6 hours each day, we will start to ascend a bit higher. The route will take you along the pristine crystal clear rivers, between deep gorges, besides waterfalls and dramatic cliffs. 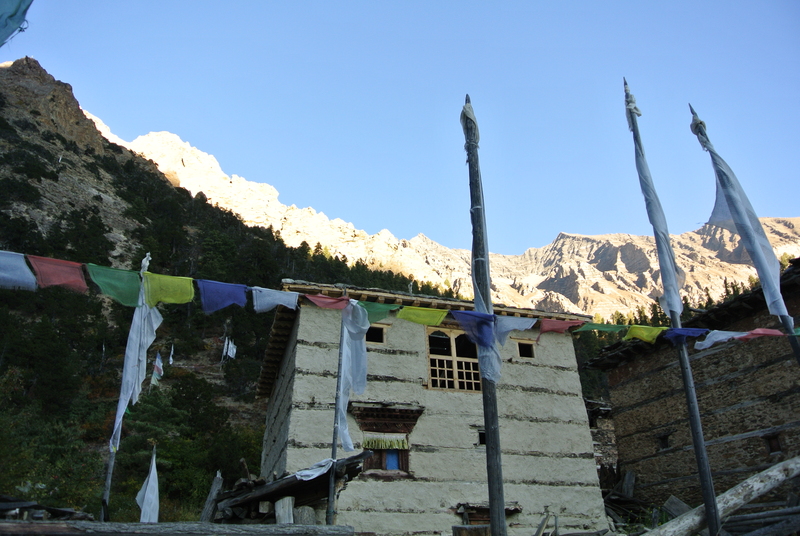 On day eight we will reach Dho Tarap (3944m), a famous settlement that has been a trading crossroad for centuries. Surrounding Dho Tarap are many sites where ancient Monasteries which sit in the hidden valley dating back thousands of years. There will be two days free to enjoy and explore, go on day hikes to sites of your choice if you so wish, or be guided around. You will have the opportunity to sit in the prayer ceremonies and we will act as translators if you have any questions for the locals. You will hopefully also get a chance to speak to the monks living there, however we can’t guarantee this as they may be taking a vow of silence. Days 12-17: You will trek back towards Dunai, visiting small caves and hot springs on the way. The walking pace on the way down will be a quicker as you will be very fit by this point and enjoy the decent! We will travel back down the same way we came up, and find different spots to camp depending on how slow or fast we may be walking. Once reaching Juphal, we’ll fly back towards the hustle and bustle of Kathmandu and have another day exploring the many wonders the city has to offer, including a glimpse of the living Goddess, if you are lucky. Excludes: International flights, soft drinks, alcoholic beverages, and client insurance.